ACS TIMBER TREAT is a new generation joinery preservative for pre-treatment of non-resistant timber. The product is based on modified vegetable oil, and contains two highly effective active biocides, designed to protect timber against sap stain fungi and a wide range of wood destroying fungi. 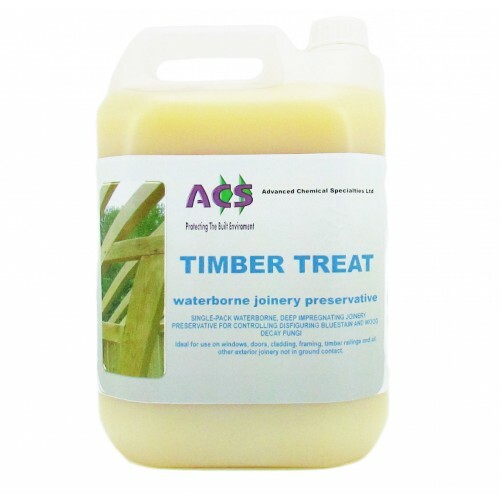 ACS TIMBER TREAT is a moisture regulating, deep penetration preservative, which provides an adhesive surface, making it receptive to a wide range of top coats. ACS TIMBER TREAT is suitable for application to all exterior timber, which is not in direct contact with water or the ground. Ensure the surface is clean, dry and free of oil, grease and wax. Any existing paint or stain should be removed and the surface cleaned of abrasion dust. Silvered or deteriorated timber should be sanded back to a sound surface. Timber Treat is a ready-to-use product. Stir well before use. Freshly treated timber should be stored under cover or on an impermeable standing to prevent losses to the ground and water. Draining loss plus any rainwater should be collected and re-used or disposed of. (Professional and Industrial users consult full TDS and SDS for complete instructions and safety information). Apply by brush or roller in 2 or 3 coats to a total application rate of 160ml/m2 (1 litre of product will treat approximately 6.25m2 of timber). Apply along the grain and allow the previous coat to be adsorbed before applying the subsequent one. Approximately 12 hours under normal conditions (20°C @ 65% Rh). Drying times may be extended at low temperatures or high humidity. Allow 24 hours before applying topcoats. Remove excess product from brushes and rollers. Wash in warm soapy water followed by a clean water rinse.